The bike parking at the City Library was pretty much full. There were a few bikes against the railings, and some bikes were "double parked" closer to the doors. This outdoor cafe was empty, but they are preparing for the May 1st, which is a big holiday for workers and students. For workers, it might mean a parade. For students, it means getting drunk and possibly getting thrown into the sea. Although not here, I think, as there is ice on the sea (just behind the bikers). But the river is ice free, so prepare to get wet! The yellow signs are saying "No bicycles- fire escape route" to stop people locking their bikes into the railings. But what on earth is this? Ruins? Bomb shelter? It's where the fish ladders start. To the right (not visible in the picture) is the dam bikeway. In the background is the dam that splits the river in half, and in the upper right corner are the concrete blocks of the bikeway dam. The first photo in the fishladder post is taken very near the upper right corner of the photo. To me it looks like some parts are missing from the ladders, look at the gaps! And where's the water? The water level is supposed to be where the whitish stains are. I took the photo yesterday, and today I read that the fish ladders are open to the customers. So they were probably leaning the ladders before the grand opening. An underwater web camera shows the fishes going past. Looking at the stats there's not much traffic yet, maybe later in May there might be some fishes to see? Oh, and there's two bikes in the last picture, too. One, possibly stolen bike thrown into the river. And one parked bike. Can you spot it? 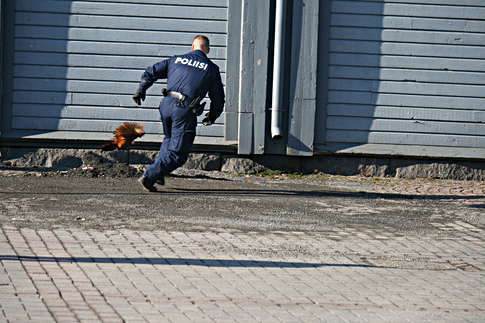 The police had to chase a rooster in the market square. Apparently it's not enough that easter bunnies and chickens (made from toilet paper rolls etc by pre-school kids) are used for decorating the homes. Some one let a rooster loose on the market square. The weather was warm, reaching +18C, the highest this spring. Combined with a lack of wind, the weather was very good for sitting outside and drinking beer. Some restaurants and pubs had queues for the tables outside. Someone burned down their firewood shelter, but managed to save his house. He was 'scorching the earth', aka burning the last years grass to fertilize the soil and to accelerate the growth of new grass. Now is the best time to do that, as the old grass has dried and the new grass has not started to grow, so the new grass will not suffer from the fire. Dry grass burns fast, so be careful. The city is lowering the speed limit on one road near the university from 60km/h to 50km/h. The reasons cited are improving safety and the several intersections on the short section of the road. Readers comments so far vary from "it's good" to "it will create horrible traffic jams." On a more sad note, at least five people have drowned in the last week. One of them was an adult, who was ice fishing on weak ice. One was a two year old, who fell into a rain well, because the manhole cover was not in place. The manhole cover is made of aluminum and is lightweight, so it was supposed to be bolted down. The police is investigating the case. Two kids fell into a stream or river while playing outside. A third, 10 year old fell off a bridge and fell into the river below. Water is attractive to kids, and it's fun to build dams or poke at the chunks of ice or throw things into the stream. But this time of the year the water is near freezing, with the water level higher and the flow faster due to the melting snow. Four kids drowned in one week! Easter bonfire is a local easter tradition. The story goes like this: with Jesus dying on the cross on the Good Friday, the evil forces are temporarily able to roam freely. Trying to scare the witches away, people start huge bonfires. The bigger flames and more sparks out of the fire, the better it works as a witch repellant. If there is no bonfire, the witches might come to your house and sabotage it or make your cows sick or cast evil spells on your fields or something like that. On Good Friday, the Lions Club built a bonfire in a small island in the river. They collected money for some good cause, by selling sausages, balloons etc. The island is a park, so there was no parking places for cars. People parked somewhere else and walked to the bonfire, or arrived by bicycle. The Bonfire and the man with matches. While selecting photos for the catkin post I had a photo I was going to put there, but then I got the idea that it would be worth a blog post on own. With another photo to really drive (hmm, not on a cycling blog) hammer in the point. The "overflow dam" of the hydro power plant. The bar you see in the front of the picture is an axle, part of machinery to control the sluice gates. In the dam you see also has holes where the water gets out when it reaches high enough level, to prevent flooding. As you can see, all of the water has been going through the power plant, no need to waste water by letting it go through the sluice gates. Fish ladder to get past the hydro dam. What do these photos to have with cycling? Compare the pictures. First is the hydro dam. Effective at getting as much water as possible through the turbines. Not very pretty and definately unappealing to fish. Height difference is too big for them to jump, and they can't get through the turbines. The fish ladder looks nice, even in April. Fishes like it, obviously. The route is certainly navigable for them. And the web camera shows that salmons etc. use it too. If it wasn't for the ladders, there'd be no salmons upstream! The dam is a barrier, like a railway tracks or highway without underpasses. Or any street which does not have a safe way for cyclists and pedestrians to cross it or ride/walk along it. The barrier stops people from moving. It kills active, human powered transportation. One could also compare the fish ladder to bikeways. One might imagine that a few, strong and fearless fish might survive the dam. But the fishladder? Can you see the small fishes cycling to school and the old granma fishes cycling to bingo, with no danger from the turbine blades? This tree has it's own "catkins". I'm sure someone with an allergy can tell when they're in bloom. No green leaves yet. The bikeways have been clear for a few weeks and they've been sweeping them too. The piles of snow made by snow plows remain. Not all snow has melted in the forests. The river has some ice left on the edges. The fishermen are using row boats now. Want to go swimming? Here's a flotation device provided by nature. In Southern Florida, water temperature in the sea today is +27C (about 80F?) In Very Northern Florida, very close to zero C.
The sea looks frozen solid, and the Meteorological Institute says the ice is 50-70 cm thick out there. Of course, the spring ice is weaker and this close to the river it's not even so thick any more. I don't think anyone is walking or skiing or even ice fishing out there anymore. This bikeway has been sweeped. No gritting sand. A few degrees C above zero, half-cloudy, no strong winds. Very good! Noticed first signs of plant life, a few catkins. I tried to take photos of them, and on camera they looked OK. Now at the computer screen I can see they're out of focus. Blah. Focus is on the distant background instead of the catkins. Well, theyre just starting to grow, so I'll have other chances. The catkins are a typical Easter decoration thing here in Very Northern Florida. You'll find a vase of them in many homes, along with a plate of grass and toy chickens and eggs. Although it snowed a little yesterday, it melted away as fast as it came down. So the only ice on the bikeways you can see is in the shadows. Quite surprisingly, it looks like the last ice and snow is to be found in the underpasses. Makes me wonder how on earth did all that snow get in there, as it certainly did not rain there. This is the view on the sidewalks and bikeways in the spring: gritting sand. This shot is from a bikeway/sidewalk in the downtown. It's a slight downhill, so it gets a lot of attention from the gritting crews. If you've looked my youtube video "no snow on the bikeways", you can see how the flat sections get less gritting. There's two piles in the last picture. The pile on the back is so dark because it's made of snow with gritting sand covering. The pile on the front is just gritting sand. It's about waist high, but I couldn't get good shots of that because it was a sunny day and the pile was in the shade, the contrast difference was too big. When I was doing my spring cleaning and tuning on the bike, I changed the rear cogset. I'd forgotten the new chain so I had to ride a few kilometers with the old chain to buy a new one. It was horrible. There was these crunching sounds coming from the new rear sprockets. The old chain and the new sprockets= bad. I've heard that when you can see the air between the cogs on the big wheels, it's time to change the chain. As you can see, my chain was due to be changed soon, anyway. I hanged both chains from a hook to compare the lengths. Looking at the very first links, the old chain does not look too bad. I was supposed to rotate the picture but forgot. But you can see the chain links even without tilting your head 90 degrees to the left. But at the other end, about 70-80 chainlinks later, one can quickly see the difference. By calculating the pixels from the first picture I got about 0.5% change in length, and here its almost half a link. Maybe 75% of half a link, which also gives us the 0.5% "strech" in the chain. The new chain fits snugly. The bright spot you can see under the second link from the left is just reflection from the sprocket. I know, because I had to check it if the front sprocket is worn out. The front sprockets are fine for a while. Also there's no extra sounds from the rear sprockets, so ride is quieter with the new chain. I got around to do some video editing, and uploaded the first bit to youtube. It's just two short clips of me being not so smart and doing silly things. In the first part I cross a street in front of a car. The driver gets a scare and steps on his brakes a little. Or he stomped on the gas. Anyway his tyres are screeching. The snow piles are high so they block his visibility, and on such a bright white day any dust or scratches on the windshield make it harder to see while driving against the sun. So maybe I was not so smart when I didn't yield to him like I was supposed to, although the car was far away. In the other clip I'm leaving the railway station. I'd like to turn left, and then right. But there's a long queue of cars, and trying to filter into the moving queue of cars on icy street is not something I wanted to try. Somehow the cars polish the ice so it's often more slippery than ice on sidewalks and bikeways, even without gritting. And streets are not gritted. Then there was the taxis narrowing the road and the oncoming traffic. So the safest option was to illegally cycle on the sidewalk. Of course, I could also have chosen some other route. Later, I was on one of the bike bridges and I was checking the ice below to see when the ice on the river is going to break. Looks very promising, there was some big cracks on the ice. So maybe in a few days there will be big ice rafts coming down the river. No, they are ice fishers. I hope they check the ice frequently or they will either sink or float away. The gray building in the left is the hydro power plant, with strong current coming from a narrow 'canal'. The high lamp posts on the right are the lights of 'Raatti' athletic field, which is located on an island. That means there is moving water on both sides of the island. So in theory, that whole block of ice could crack loose of the island and float out to the sea. As the winter is mostly over, there's not much to blog about that can't be read anywhere else. It's above freezing, the bikeways are almost ice free, so I must get new ideas. The easiest way to get them is to steal them, of course. This time the victim is LGRAB- Let's Go Ride A Bike. April showers- A very good topic. It's raining again, the second time in April. Today the rain has been on-off weak drizzle, but it's been raining every time I went outside. Yesterday I thought we might get some snow, but the forecast was wrong. Snow is melting really fast when it's raining. Blah. Nothing more to say about that. Rain is just boring. Bike maintenance- On the day Dottie posted her blog about her bike's tuneup, I was also doing some maintenance work. Just washing the bike and spilling oil on the floor, mostly. Today it was raining and I didn't want to go outside, so I adjusted the brakes. For the last few days we've had temperatures above +0C, and yesterday it even rained water! So this means that the ice on the bikeways has been melting quickly. Although the forecast says there's going to be some snow tomorrow and the day after, now that the bikeways have been ice free, most of it will melt immediately and the sun will quickly melt the rest of it. Sun rises today 06:21and sun sets 20:22, so the sun is really working to get the ice and snow out of here. Gritting sand sinks into the ice, leaving rough surface. I'll have to check tomorrow if there's any ice left on that uphill. It's been several days after those photos. Today I had to be looking for the ice to find some so I could take a photo. I'd say more than 95% of bikeways are ice free. That's during the day. Who knows how much black ice there'll be in the morning. The trips are distances to the parking lot, or in the case of bike, to the front door where the bike parking is. Rotuaari, the pedestrian shopping street has obviously no parking, so one will have to park somewhere else and walk to the destination. There's been some plans that cycling on the pedestrian steet would be banned, but it's not happened yet. One can quickly see that it's most profitable to go to the first supermarket by bike, as the trip is almost half compared to the car. For that trip, the bikeways are more direct and the car has to stop at several traffic lights. Fuel cost by car is at least 70c, divided by 4km on bicycle means I save 17,5c per kilometer every time I go shopping there. The downtown supermarkets, the market square and Rotuaari are south of the river. There's only a limited number of bridges which limits the route options. Also the downtown area has streets on a grid, so the bike routes are on the grid too. No short cuts for bikes there. The difference between car and bike is lost. So the savings will drop to 10c per kilometer plus parking. For some reason, the new fuel mix E10 has not become as popular as predicted. It is a new product and nobody wants to let fuel companies use their car for testing. Despite assurances that the fuel is good and can be used on cars which are on the 'E10 compatible vehicles list', many people prefer to use the slightly more expensive 98E5. Maybe they suspect that the list is not accurate (as there has been several cars added/removed on the list already) or that any damage caused by the fuel will be diffucult to prove, and the car owner will have to pay the repairs themselves and they can't shift the costs to those who sold them the defective fuel and told them it is safe to use on their car. One finnish tabloid newspaper, iltalehti has an article (in finnish) about their quick, not very accurate test drive. They drove a stretch of about 350km twice, once using E10 and the return trip using 98E5. Most of the trip was on quiet roads, following speed limits. They found out that using the more expensive 98E5 was cheaper in the end than the E10 fuel. The Ford Mondeo with 1,6l engine used 6,25 liters/100km of 98E5 and 6,68 liters/100km. The cost of using E10 was about 3,5% higher than 98E5. 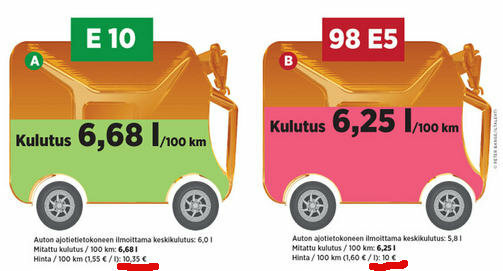 (Source: iltalehti) Check the costs! 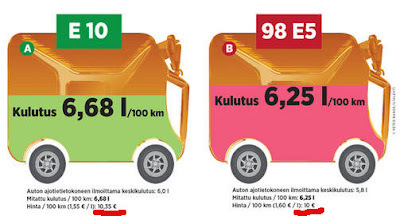 The three lines below the cars are: fuel consumption reported by car computer, measured consumption, cost per 100km. The final cost is pretty much the same, 10€ vs 10,35€ per 100km. That's ten cents per km, on fuel alone.